Some business ideas are really hard to fathom. Action figures are cool if you’re eight, and not cool if you’re twenty-eight (yes, I’m talking to you! Get a girlfriend!). 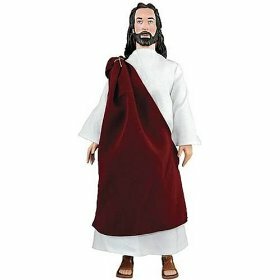 But Jesus action figures? Some Christian parents may be squeamish about negatively influencing their little ones with Ben 10 dolls or a Ninja Turtle or whatever. When Junior whines that all the cool kids have one, you can understand the parents’ desire to help him fit in. What you can’t understand is the thought process that leads said parents to think that a Jesus doll is going to address playground coolness issues. Oddly enough, there seems to be a wide market for this kind of thing. It possibly appeals to hyper-conservative Christians with a blindspot for all but the most overt forms of blasphemy and a deeply stunted sense of irony. If there are enough of these people in the world to make this doll viable, I am officially afraid. Otherwise there’s a large group of people with irony in hyperdrive who have the budget to battle their modified robot-wars Jesus doll against whatever Hindu avatar they could find. Either way, the planet is in bad shape. 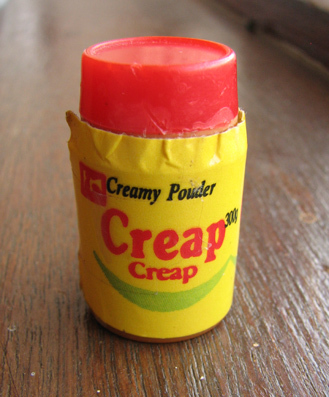 This is a tiny toy coffee creamer tub. Creap pouder is definitely going to bring down the tone of my daughter’s imaginary tea parties. 'A Quiet Place': genius or ungenius?